Welcome to the Church of the Holy Spirit! Whether you are just visiting or looking for a church to call home, we welcome you. The Episcopal Church strives to live by the message of Christ, in which there are no outcasts and all are welcome. It is our hope that you will feel Christ's presence as you worship with us. We welcome all newcomers and guests no matter who they are. Some come to us from other Christian traditions, some from other faiths and some with no religious experience at all. Wherever you find yourself on your spiritual journey, Church of the Holy Spirit can be the soft place where you can fall, the warm place in your heart you can call home and the loving place where you can worship with people who will care for you unconditionally. If you are new to the Episcopal Church, you'll discover that our worship style is very interactive and participatory. When you come through the main doors of our church you'll enter a gathering place we call the Narthex. We use a bulletin and the Book of Common Prayer as guides for worship. You'll hear people responding during the service and you'll see people sitting, standing and kneeling depending on whether we are learning listening, singing or praying. Everything we do is indicated in the bulletin. Please don't feel awkward or embarrassed if you don't keep up -- just do what you are comfortable with and, if you'd like help, the people near you would be happy to assist...just ask. Savor the richness and beauty of worship and try not to worry too much about the details. The important thing is that you are here....all of us were newcomers once. Newcomers to Holy Spirit and others interested in an overview of the Episcopal expression of Christianity are invited to attend the Adult Inquirer's Class held twice a year. This class begins with a "Welcoming Breakfast". Led by Father Phil, the class explores church history, church customs, the Bible and more. Contact Michelle Marlow for more information. There are a variety of social functions throughout the year at Holy Spirit to help newcomers become better acquainted with others. 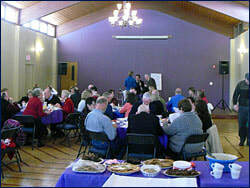 Potluck Dinners, Youth Group Lock-Ins, musical events and many more. Check the church calendar and the upcoming events link for updates. Coffee Hour is every Sunday following the 8 and 10 o'clock services, and this is a great opportunity to get to know other people. Sunday School and Adult or Teen Formation takes place during the coffee hour following the 8 o'clock service. Information can be found on our Christian Formation links or by emailing Michelle Marlow. Breakfast is every first Sunday of the month (excluding June, July and August) between services (at 9 am) You can host a Breakfast or join an existing group or just come and enjoy the food and fellowship. Contact Carol Crawford-Jones for more information -- 908 735-4510. For information regarding the Children's Chapel and Nursery, email Trisha Simpson-Curtin. You can also volunteer your talents for one of our ministries. For more information, contact our Deacon and Outreach Coordinator, Dot Hospador. Are you or someone you know in need of Intercessory Prayer? We have a group of volunteers who offer daily prayers for healing. To add someone to the list, contact Barbara Burton. Want to have prayers offered during a Sunday service for someone? Add the names to the sheet in the Narthex and they will be mentioned during the Prayers of the People. 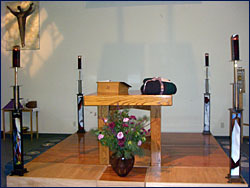 Flowers on the altar are donated by members of the congregation as a Thanksgiving or Memorial. The sign-up sheet and a donation envelope are in the Narthex. You may notice Father Phil blessing shawls during Sunday Services. Holy Spirit’s Shawl Ministry knits or crochets shawls for anyone who is in need of comfort or solace as they are experiencing life's trials and tribulations. The shawls are packaged with a ribbon and a greeting card with prayers extended to both creator and recipient of the shawl. The group that creates the shawls, Knit and Chat, meets on Monday evenings at 7:30 in the church office. If you know someone in need, would like to participate or would like more information, contact Deacon Dot. We invite you to join in our family, in our worship, in our fellowship, in our prayers and in our ministries!